We love photos but maternity shots have to be at the top of the list of cute photo taking opportunities! We’ve seen our fair share of amazing pregnancy photo shoot ideas and even goofy ways to announce a pregnancy, but these photos really took the cake! If you are expecting, or know some one who is, be sure to scroll through and choose your favorites! 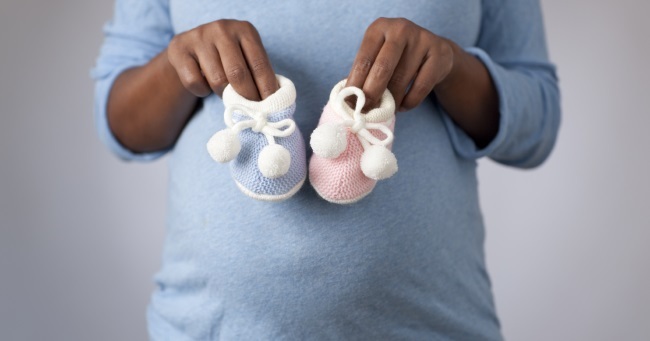 Are you waiting to either find out the gender of your little one OR not announcing it till their big day?? This is a cute maternity announcement photo. If you already have kids, try to capture those last moments before your new child arrives. Love how this mom took a pregnancy shot of her with her son mere days before his sibling arrived. What a special moment. Offer a sneak peak or a window into the womb. I love the “heart” hands with a recent sonogram over the belly in this mommy-and-me-shot. Let’s be honest, the pregnancy countdown begins the moment you see those tiny lines on a pregnancy test. These tally marks on the belly are a tangible way to take a maternity photoshoot capturing that countdown in a memorable (and adorable) way! Do you and your hubby have a favorite sport? This couple enjoys, you got it, Baseball. Use paint in a maternity photo to decorate the belly to commemorate the sport your future kiddo will grow up loving as much as you do! I make Humans. 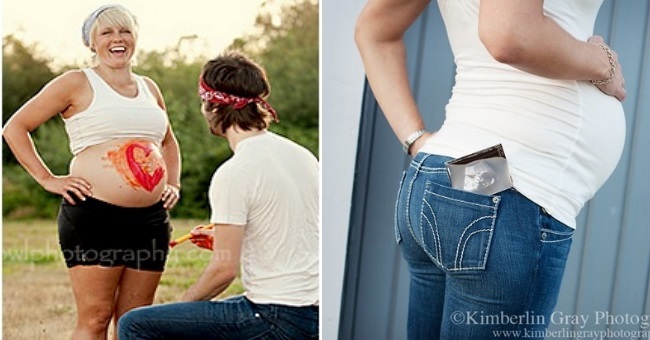 A little bit sassy, this idea for baby bump photos had us laughing! A throwback to another era with a modern twist, this mama is definitely letting her strength come forth! In our technology age, one of the cutest pregnancy picture ideas we’ve come across is the loading sign. You can get it painted on your belly for a fun photo shoot or even grab the shirt for everyday laughs. Yes. We’re in love with shadows, but this maternity selfie is one of the most gorgeous maternity poses! Even if you are not able to hire a professional maternity photographer, this is one you can do yourself that will still preserve this wonderful time in your life as you wait for the arrival of your newborn. A shadow of what is to come, we are in love with these pregnancy photos that involve the dad casting a heart shaped shadow of the mom’s belly. Love, life and laughter all coming so soon as a family grows together in love. The artistic aspect of these maternity photos totally make us swoon! We all tracked our pregnancy with those charts “your child is not the size of a walnut” and later “they are the size of a small grapefruit”. What a great idea – take a photo along with the food that is representing the size of your baby as they are growing. It is a fun week-by-week pregnancy photo idea. You can even make your own chalkboard to track your pregnancy week by week. Write baby’s size on the board, your pregnancy cravings and other symptoms. 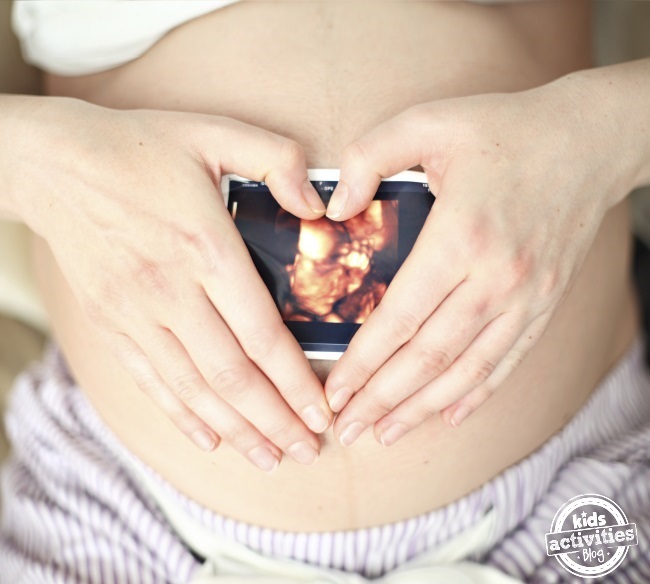 It will be a fun way to do pregnancy photos and document your pregnancy without forgetting a thing! One of the most fun baby announcements is revealing the name! We loved the idea to use children’s blocks to spell out the child’s name over mom’s belly. What a sweet reveal through photos to share with friends and family! If you and a friend are pregnant at the same time, baby bump photos together are basically a requirement. Although the possibilities are endless this shot of mommy best friends and baby best friends definitely melted our hearts! Get silly. Grab some paint and show your little one how much they mean to you with a big red heart! Paint always makes photo shoots more fun! Put the sonogram into your pocket. What a cute way to feature your belly in silhouette along with the image (sonogram) that you look at *so* many times throughout the day! Cute maternity photo shoot. SO goofy! If you have a partner who loves to laugh at himself, go for it! Document all of the bellies in your household. I love the sympathetic pregnancy shots. How babies are made. It’s the age old question “where do babies come from”. 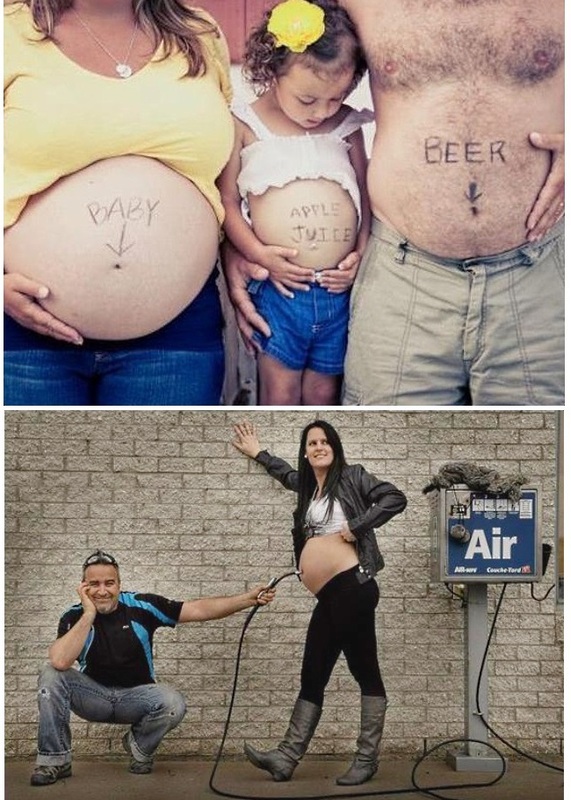 According to this family they come from a lot of air! This is one adorable way to announce your pregnancy and document it until your little one arrives! You can use your maternity photos to reveal your kiddo’s gender. These baby booties are just adorable! 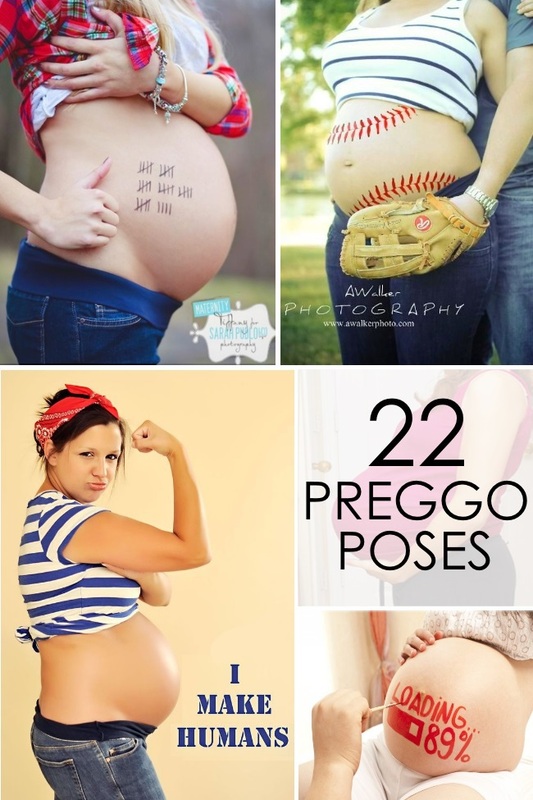 Do you have favorite pregnancy poses that you like to do when you are pregnant? If you are still prepping for pregnancy or trying to recover from your stretch marks, we can help with that too! 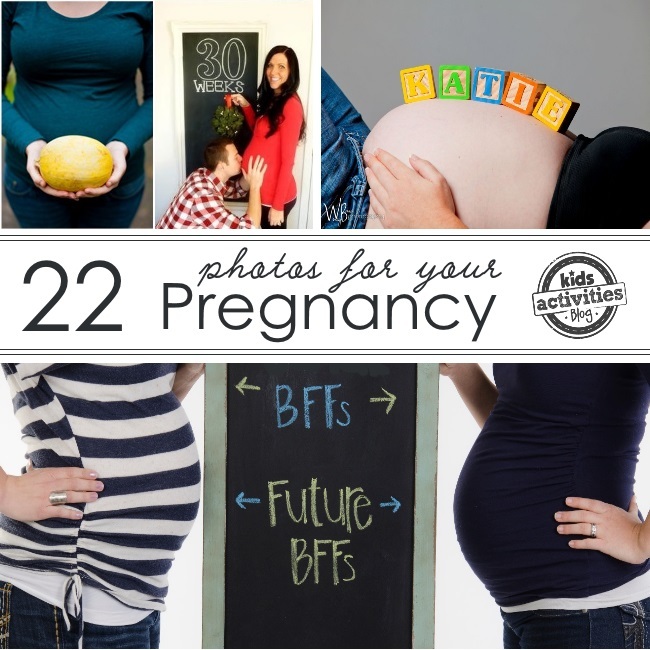 These pregnancy photos are so fun and exciting. I am certainly going to take some inspiration for the studio with these and provide it for my clients. Thanks and keep the fun maternity ideas coming.